Temer set up the meeting following inquiries from the European Union and China over the scandal. RIO DE JANEIRO: Brazil's president met Sunday with dozens of ambassadors from countries that import Brazilian meat, seeking to minimize damage from a corruption probe that alleges meatpackers bribed inspectors to keep rotten meat on the market. Speaking at the presidential palace, President Michel Temer told the diplomats that Brazil's "government wants to reiterate its confidence in the quality of our national product." Temer set up the meeting following inquiries from the European Union and China over the scandal. Federal police issued 38 arrest warrants involving the giant meatpackers JBS and BRF in a blow to Brazil's reputation as one of the world's leading meat producers. The president minimized the investigation, saying that only 33 of the 11,000 inspectors at the Agriculture Ministry are being investigated for allegedly taking bribes to overlook meatpackers using chemicals to improve the appearance and smell of expired meat. Some of the bad meat was exported to Europe, investigators have said. 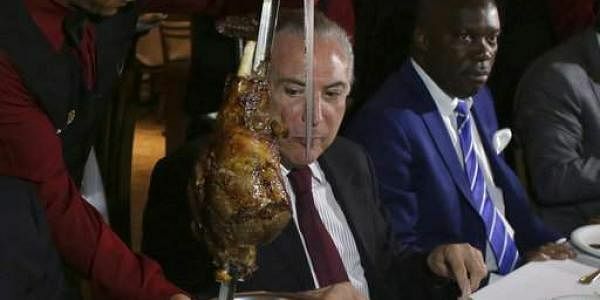 Temer told the ambassadors that the Agriculture Ministry would soon release a list of countries that could have received rotten meat as well as the name of the meatpackers responsible. Temer said a task force would be created to speed up the investigation of the plants that were targeted. In a statement, his office also said it wanted to reiterate that packing plants are open to inspection by nations that buy Brazilian meats. Wrapping up the meeting, the president invited the ambassadors for dinner at a traditional Brazilian barbecue restaurant in Brasilia. Earlier, Temer met with his agriculture and foreign commerce ministers as well as meatpacking industry leaders to talk about impact of the case. Authorities say that out of the 4,800 meatpacking facilities subject to federal inspection in Brazil, 21 are under investigation, including units of the two big companies JBS and BRF. Federal police also said Friday the two-year investigation had determined that part of the money allegedly paid by JBS and BRF was channeled to two of Brazil's major political parties, including Temer's.